There are two huge issues facing the fund and portfolio management business at large are the high fees they charge and the inconsistency of their portfolio returns. Fees are a killer and at recent high levels they have had a huge and detrimental effect on the portfolio values of their clients. Portfolio returns are a very topical subject at the moment but Stockradar research shows the financial industry is not providing, with their active and passive offerings, what is needed. Clients are being brainwashed into thinking that “active” or “passive” are the only alternatives and that has become quite entrenched in common thought. Investors have become frustrated by the under-performance of these offerings and the attendant high fees. Happily, there is another alternative, one which is aimed squarely at the end-user rather than the provider. The success of a passive approach is market dependent. Where the market goes you will follow and you will pay fees for that ‘feature’. This may suit some time poor, agnostic investors but at roughly 0.5% in fees this is still too high because there is no work involved apart from buying stocks in your ETF to reflect the market action and fund flows. It’s a no-brainer, a computer can do it, and it’s a huge money generator for the providers. The two approaches above of active and passive are for the benefit of the manager not the end-user – which is you. An active manager will tell you they outperform if they go down 19% and the market drops 20%. True, but it doesn’t help us. They have little respect for capital protection as they focus squarely on index performance and that goes up as well as down. But that’s not the only choice. In fact in this business smaller is better – *it’s just that the biggies can shout a little louder and often it is the new investors that rally to the call. It’s not their fault but they know no better. There are managers out there that actually make good money on their stock market investments but these aren’t pigeon holed as active or passive. When people ask me about my investment philosophy, I do not like to be pigeon-holed. My portfolios may hold a mix of value or growth stocks. Since our models portfolio’s have an absolute return strategy, my objective is how I can maximise upside returns while minimising downside risk for my clients. Stockradar’s approach requires discipline and control. It is built on a solid and tested methodology for generating profits and managing risk that delivers steady growth in equity regardless of market performance. It is an absolute strategy and is suited to you the end-user because of the stated objective – to grow your capital year on year with a big focus on capital preservation. For this ‘safety net’ approach you may trade off some upside but most can live with that in the name of capital preservation. Capital preservation is a must for the SMSF manager or in fact any cautious investor. The provision of a solid flat fee two-tier trading plan. A clear focus on cost-minimisation strategies, which are inherent in both trading plan structures. For those clients who have an SMSF, Stockradar has an arrangement with a registered accountant who offers a very competitive flat fee for all your SMSF accounting and auditing requirements. The basic service provides a model-trading plan covering 160 stocks. Guidance and live examples on the website applying all the necessary elements of a successful trading plan are offered here. The portfolio service is a personalised service aimed at assisting members to understand how to build and run a diversified, controlled and properly risk-managed portfolio using Stockradar’s 160 stock universe as a source of stocks. The portfolio service is intended for those clients who would like a more assisted pathway to success. For my members the portfolio service is priced more than competitively at a flat fee ($1495) for any portfolios under $1M and we now have arranged to work with a registered Australian SMSF accountant who offers a very competitive flat fee for completing all your SMSF needs. This compelling combination is available to you now. Now is the time to take control of your stock market investments and keep your retirement objectives safe. * Ref. Dow Jones Indices versus Active Australian Scorecard. The strategy you can stick with in good times and bad. And is also the strategy that lets you sleep comfortably at night, every night. It’s the strategy that fits your nature and that you are comfortable with. I have a little secret. In in all my years of running the Stockradar portfolio the heart and soul that has been a constant in driving returns has been the good ‘old boilers’ of the industrial sector, especially during corrective phases. Words I’d use to describe these stocks are safer, less volatile, steady, solid, often high yielding with more consistent trend behaviour but alas they can be somewhat boring compared to the fascination with gold, mining and the odd biotech and technology stocks. The latter we really have to leave to the US market, as that is where the real biotech and technology stocks are. Here it is really either mining or Industrial stocks and depending on your appetite for risk and how far you want to slide down the market capitalisation scale. Mining is no doubt a more dangerous sector and no matter which way you look at it you have to be sharp to be able to jump on the big up swings and then make sure you profit from them. i.e. don’t let those profits evaporate because they can, and very quickly. Most of the time they jump about abruptly causing me to have more trades, less winners, but in this sector when you win, you win big. So it can sometimes be tough for the SMSF or portfolio manager in deciding what to put on the watch list of stocks and to find the balance between mining and industrials. Our solid block of industrials move in and out of steady, and for the most part, reliable trends so if you’re looking for the steadiest low risk returns you could almost blow away everything else and just focus on the Industrials. Even now the industrials are exerting muscle again as they jump to new highs leading the Nasdaq higher. 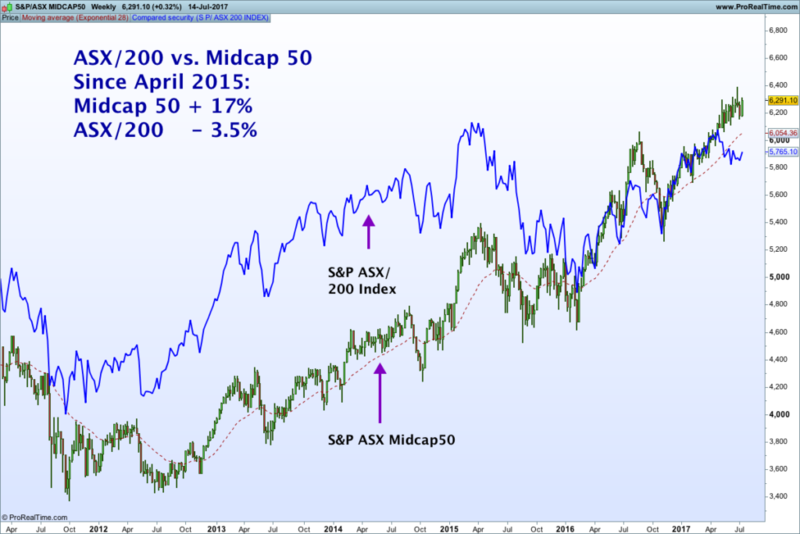 Yes I still cover other ASX/200 stocks and every now and then we get on to a big swing like the miners of 2016 where we made some great profits in an otherwise flat market. So some mining weighting is still sensible in the name of diversity. Even now as I look at the market we see banks and miners struggling but the performers that are still working hard for us are the midcap industrials. /wp-content/uploads/2018/03/logo.png 0 0 Stockradar /wp-content/uploads/2018/03/logo.png Stockradar2017-07-17 15:58:222017-07-17 15:58:22I have a little secret. Building a weight of evidence is always the aim when making a case either way for a price move by a stock. Sometimes the evidence is strong and generates a clear signal whilst at other times when it’s not as clear then a neutral stance is the safest route. It’s that simple but ‘seeing’ the evidence clearly and for what it is without tainting with your own biases is difficult at times. That’s why we build rules to control our biases and influence over what the price action might bring. Detaching yourself is a real discipline. These rules are built, developed and fine-tuned over time, that allows you to develop good rule-based arguments that control your trading (and yourself) and that will generate consistent results. These rules will have an objective that you have set out to achieve. Then from a quant perspective it is a matter of overlaying the rule based template on stock price behaviour and repeatedly and automatically responding to the signals generated. That ‘consistent’ process equals ‘consistent’ outcomes. Market conditions will dictate, to some degree performance and your rule-based trade plan also needs to be able cater for that whether its generating profits or simply maintaining a cash (safe) position that is not losing your money. Sometimes that is the best place to be. My starting point of analysis is to identify major price points of resistance and support that the price moves through and then look to the specific price action to generate one of my three price setups. 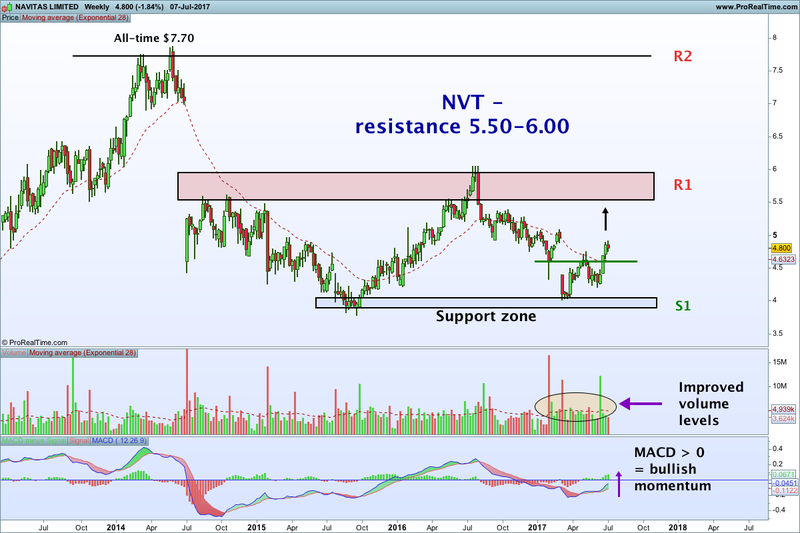 Above you can see NVT has a strong combination of support followed by trend reversing price action that puts high odds that NVT may move to the next resistance level ($5.50-6.00). Support comes from a ground swell of arguments that include rising volume levels as the price tests support and then follows the trend reversal price action higher adding a healthy degree of validation. The price is now above the moving average, which heightens probabilities that the price can rise further. The final argument to be put in place is; does the stock have momentum (crowd behaviour). Well that’s not happened yet as the reversal of price from down to up may only just be beginning. When the MACD does rise above zero it adds a positive price acceleration factor to the mix. Having double bottomed off support and triggered a trend reversal with strong Trend Intensity (Stockradar’s unique trend filter) support it puts NVT in a position of confirmed trend status. This means the the price is more likely to rise than fall.